I truly love discovering beautiful hidden gems in Sydney. Being creatures of habit after a long week of work - one tends to eat at the usual local diner, order the regular cocktail and hang out at the same pub on the corner. We don't like to be disappointed so we stick to what we know so we play it safe. I made a conscious decision this year to explore more of Sydney - eat at places which were unfamiliar, visit art galleries and exhibitions, and familiarise myself with this place I now call home. Often we travel - to get away from the familiar. But in doing so we forget the cute and charismatic charm of the city which we're from. I stumbled across this bar when walking past the Pullman Quay Grand Sydney Harbour. It's tucked away from the streets. With luscious vegetation hanging from the ceiling, a fit out of pink and green armchairs, the bar gets its inspiration from Cuban plantation architecture and the Miami of the 1950s. 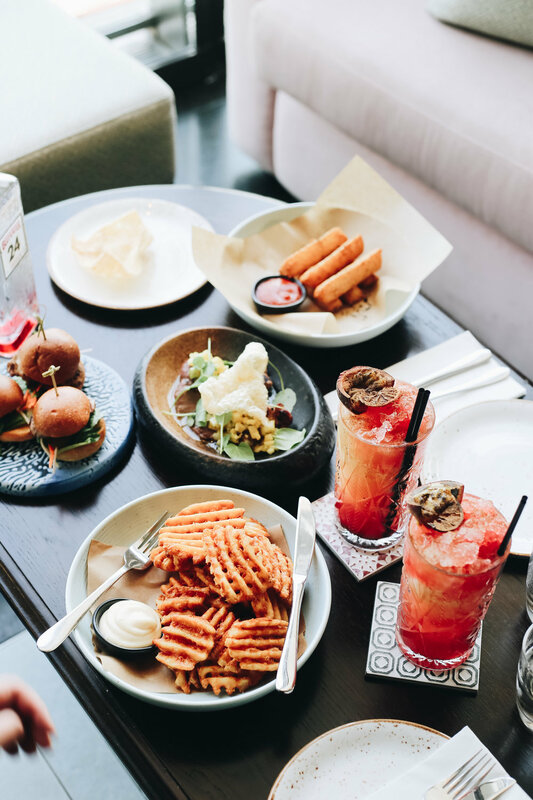 With an incredible view of Circular Quay, looking out at the harbour, the city's newest hotel bar offers tropical cocktails and delicious nibbles with a strong focus on Latin American flavours. I'd highly recommend the chicken sliders, waffle fries and pork neck! So if you're keen for a good meal and a round of tasty cocktails, Hacienda is definitely the place to be! Get to know your city a little more and don't be afraid to visit that new bar or eat somewhere you haven't eaten before! Walking Dead Cocktails : Rum, Grapefruit, Passionfruit Puree, Cinnamon Syrup, Angostura Bitters and Pernod Absinthe.